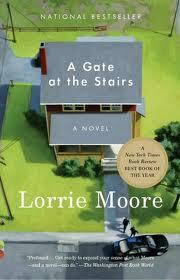 a book chick: "a gate at the stairs"
"a gate at the stairs"
my take: my mother had two copies of this, so she tossed one my way - without recommendation or explanation or anything. as i started reading, i got the feeling something was going to go wrong ... and so i read with fear and trepidation that the "gate at the stairs" had some bad outcome. not at all what i expected to go wrong went wrong, so that was nice. the novel is set in a medium size college town narrated by a small town college age woman. she was immature and mature, as people that age are, so fairly convincing point of view. i did not "devour" this ... in fact, got a bit distracted by other books. so it was a leisurely read that i dragged out. would like to hear if anybody "got into" it more than i did.